Well designed furniture conveys emotion. It's about feeling with more than the senses. "Natchez," a new furniture collection from Lloyd/Flanders®, is based on romance. Elements such as sweeping lines and indulgently curved backs anchor a collection sure to turn any head. Like its namesake on the historic Mississippi, the Natchez Collection represents that hard-to-find gem worth hunting for. But the Collections's delicacy doesn't mean it's lost any trademark American strength. 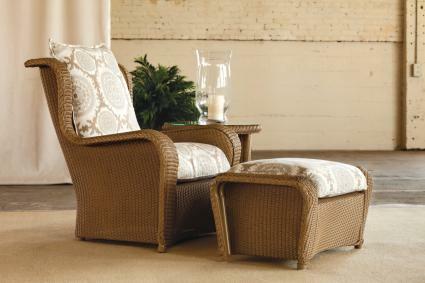 Smooth-lined wicker is gently tucked around sturdy metal frames, ensuring long lasting, indoor/outdoor durability.